Curious, I peeked inside, and discovered that it is a collection of excuses mikveh-going mothers have used to explain to their children why they must leave the house on mikve night. I love this, and I need ideas! I was very recently wondering what other mothers do say to their children! I have gotten into the habit of saying I am going to learn Torah, because I figure that the act of preparing to immerse always involves reviewing the Halacha. If I am asked who I am learning with I might name my mikvah attendant. interesting idea. one of the mothers wrote in the “excuses book” that she “is going to do a mitzvah.” though she explains that she often tells her children that she is “going to do a mitzvah”– if you’ve never said it before, it might sound strange. I do the same. I say I am going to shul. It’s true. Mikvah is in the shul. Or maybe it’s worse when the mikva is beside the shul than in the shul. Of course I would give excuses like “I am going to help a friend”. (Somewhat true!) 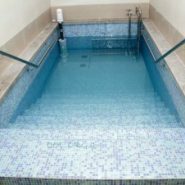 But I wouldn’t get too elaborate with excuses, because I would rather that my children suspect me of going to the mikvah, than to conclude that I never go. I really take issue with this whole “excuse” culture. Firstly, even though I rarely leave the house in the evening, and even more rarely at night, I really *don’t* need an excuse to leave the house alone. And I really *should* take walks by myself more often. Secondly, I don’t believe in lying to kids. Thirdly, I’m the mommy who told her kids that boys have a hole for pee and a hole for poop, and girls have a third hole for babies to come out of. Kids will need to know this stuff later on, better that they hear it from us than have to guess or hear it from others. And if we lie to them, they’ll understand these topics are taboo and won’t feel comfortable asking us. Worse, they’ll know we lied to them and won’t trust us to give honest answers not only about this topic but about many others as well. Nope, not what I want. At first I was saying that I’m going to visit a friend (and I really do like the mikvah ladies). Sometimes my husband still fills that excuse in. But usually I just say I’m going “somewhere” or “I’m taking a walk by myself.” Because it’s not their business (I don’t explain every doctor visit, either), I’m not about to lie (no car, we walk everywhere, and it’s 10-15 minutes of a walk each way), and if one day they do two plus two, guess what, the sky won’t fall down. LOOOOOVE this. Yes, I just tell my children I’m going ‘somewhere’ and ‘out’ too! And funny ive also told them that we have a special hole where babies come out, when they asked. Hahaha very funny😉 i tell my kids every month ladies gather for a tehillim reading…which is true since thats what we do..so its really not a lie..
you mean you read tehillim together in the waiting room? Thank you so much Chana Jenny, these are great! My boys would go to the Mikva with their dad and my daughter would ask if she could go. We explained that men go in groups and women go privately not even with daughters. The only times I had to come up with awkward excuses were for Friday nights. For weeknights, no one asked or cared much when I was going out (I guess because Ima was always in the run somewhere), and most of the time it was after the kids’ bedtimes, anyway. But one memorable Friday night kind of broke the ice. I was heading out and said something vague about wanting to visit a neighbor who needed to talk – the kids were old enough then to be left alone but I figured, young enough to be oblivious about this business. Well, my son looked up at me and said, “Oh. I bet you’re going to the mikva, right?” He said it with such an innocent and straightforward tone. I realized, if it did not seem like something taboo and secretive to him, I was just turning it into that. For tznius, excuses are ok, though. But don’t get neurotic about it. Great article – I always use the excuse that I am going to the store (and I actually go before the mikveh!) or taking a walk. I understand the commenters who would like to be open with their children. The problem is that when the children are older, if your practice is to inform everyone of your impending mivkeh visit, and you have been open with them about the other details of marriage, they can figure out for themselves what comes after mikveh. Personally, it would make me quite uncomfortable for my two teenage daughters to know that I am going to mikveh. Plus, I really feel that this is such a private, special time between husband and wife, why do the kids need to be in on it? There is plenty of time for them to learn later, and once the kids are married, I’m sure they will figure out why Ima disappeared every once in a while, had to take showers at strange times, etc. Yes, it is important to be open with the children and make sure that they have proper information, but in my opinion, this aspect in particular can wait until marriage. I was a mikveh lady for almost 15 years. A special perk was laughing at the excuses, and sharing stories. The funniest I had was when a woman came in and pushed a jar of jelly into my hands. It was Chanukah, and her excuse to her children was she couldn’t finish making the sufganiyot until she bought the jelly! On the other end, we had a matzah baking night for men in my house. It was that special night for me. When I came home my 9 year old said “I know where you were”, being naive I asked him. Well, he proudly said the mikveh. All of the men turned red and put their heads down fast. When I asked him later why he said that, he said they just learned in Chumash that a woman after birth goes to the mikveh, and since I had a baby I must have gone to the Mikveh…. Treasure your stories ladies! Now that the era has ended I share some of those stories with my daughters-in-law and we can laugh together. The mystery is an added jewel in our crowns of glory. fascinating discussion. i’m in favor of having some privacy about the mikvah. but i do take my girls to see the mikveh sometimes when we go tovel keilim, just so they’ll see it’s a nice place and associate it with some good memories when they get older.